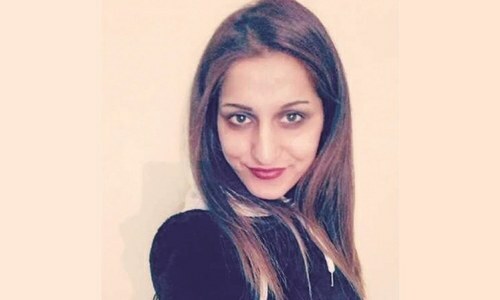 Pakistani-origin Italian citizen Sana Cheema ─ whose death in Gujrat, was reported by Italian media as an alleged honour killing ─ was found to have been strangled to death, according to an autopsy report obtained by Dawn on Wednesday. The autopsy was conducted by Aziz Bhatti Shaheed Teaching Hospital’s Dr Komal Ishaq after the Punjab Forensic Science Agency sent Sana’s forensic report to the hospital. The forensic report stated that the victim’s voice box was swollen and the right cornua of her hyoid bone (in the neck) had been dislocated. The forensic report had also suggested regurgitation after three pieces of green chilli were found in her sound box. PFSA did not find any signs of poison or drugs in Sana’s body. “It has now been confirmed that she was strangled to death. And according to the report, her neck was also broken,” Irfan Sulehri, a senior police officer in Gujrat told AFP. A second police officer from Gujrat, Waqar Gujjar, confirmed the findings of the forensic report. The victim’s father Ghulam Mustafa Cheema and her brother Adnan Cheema are in police custody and Section 311 of the Pakistan Penal Code (punishment after waiver or compounding of right of qisas in qatl-i-amd) is being added to the case that has already been registered under Section 302 of PPC against them, Gujrat District Police Officer Jahanzeb Nazeer Khan told Dawn. Sana’s uncle, who had originally been nominated in the case along with Mustafa and Adnan, has been exonerated of all charges. Police in Gujrat had last month exhumed Sana’s remains on the orders of a magistrate after news of her alleged honour killing made headlines in Italy. The 26-year-old victim’s family had claimed she had died of natural causes and buried her without a post-mortem examination. Police said Sana’s father Ghulam Mustafa had brought her back to Pakistan to get married. This ultimately led to a confrontation with a nearby family who spurned the offer of a match, according to the woman’s family. Because of the rejection Sana refused to eat, fell ill and died, her relatives had told police. However, a local Italian newspaper, Giornale di Brescia reported that she had been killed for “honour”. Members of the Pakistani community in Brescia, Italy, had held a demonstration, demanding to know the truth about her death. The victim’s friends claimed that Sana had wanted to marry someone in Italy, against her family’s wishes. News reports further alleged that Sana’s parents had been forcing her to marry someone in the family in the days leading up to her murder. According to Italian media, Sana had wanted to marry a man from Brescia who, like her, was a second-generation immigrant with Italian citizenship. According to Asad Gujjar, a Gujrat police spokesperson, police visited Mangowal town, where Sana had been staying with her family, and collected some information about her death which strengthened their suspicions about the version offered by the woman’s family. After an initial inquiry, the police lodged a murder case against Sana’s father, Ghulam Mustafa, her brother Adnan, and her uncle Mazhar Iqbal Cheema, on a complaint filed by Kunjah SHO Waqar Gujjar. At the time, police had taken her father, brother and uncle into custody for questioning but had not pressed any charges against them. Gujrat police officer Mudassar Sajjad had told Dawn that they could only be charged if the forensic report confirmed that the death was caused “due to murder”. Muslim ladies have the right to choose their husbands, there can be no compulsion. It’s very disheartening to see that people calling themselves Muslims would stoop down to such level to kill their own child in then name of honour while all they are doing is dishonouring Islam by taking a life and feeding their ego. How can they use force, if the girl does not agree, she cannot be forced into a marriage, that is the shariah law of Islam. And all must abide by it so how did these people bypass it. Sad indeed. Deeply saddened to hear that. How can a father be so cruel to his daughter. Just ancient mentality of honor killing. Women have all the rights all over the world, but some narrow minded people don’t want to accept it. I feel so sad after reading that article. What they had in their mind when they are killing someone especially their loved ones??? They have no fear of God?? I believe they are not humans at all. Parents are supposed to be a source of support for children who look out for their best interest. When we read the Muslim/Bukhari Hadith we will find many many violent and Arab tradition Hadith. Somi: Do you find any ‘good’ hadiths? What about talking about good things for a change?